Shuri Castle (首里城) is one of the most popular tourist spots in Okinawa. It was used to be the castle of King Sho of Ryukyu Kingdom until 1879. Because of its historical value, it is designated as UNESCO World Heritage Site. Originally, Shuri Castle was constructed around late 14th century. Most of the buildings were lost during WWII, but stone walls and bailey remained. In 1992, the castle was fully restored as it used to be in 18th century. It shows the cultures and history of Okinawa. Unlike other Japanese castle, Shuri Castle use lots of stones and painted as red. Also, there are many dragons that are the symbol of King. 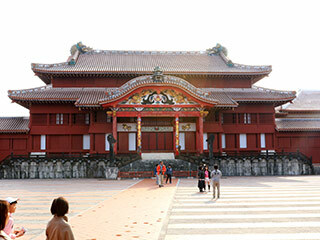 Shuri Castle takes many Chinese style, but also it takes Japanese style as well. Admission: 820 Yen for Adult, 620 Yen for Highschool, 310 for under high, free for under 6. Closed on First Wed. of July. 0. at Yui rail Kenchomae Station. 1. use Yui rail to Shuri. Shuri Castle is the former capital and the castle of Ryukyu Kingdom located in Naha, Okinawa. It was constructed in late 14th century and became the castle of Sho clan. King Sho Hashi was the first king of Okinawa for conqured all Okinawa Island and built Ryukyu Kingdom in 1406. After that, Shuri castle was the center of Ryukyu until 1879 when Ryukyu became the part of Japan. In Edo period, Ryukyu was under control of the feudal lord of Satsuma domain and also brought the tribute to China. Therefore, this castle has both cultural aspects of Chinese and Japanese influence. Today, It is registered as a part of "Gusuku Sites and Related Properties of the Kingdom of Ryukyu" of UNESCO World Heritage Site. Unlike other Japanese Castle, Shuri Castle takes Chinese style castle. That's why all the buildings are painted in red and many dragon symbol that is the proof of King in China. Stone Walls are built by Ryukyu limestones that is very easy to collet in Okinawa, and easy to cut and adjust into a specific shape. The main entrance of the castle. It is printed on Japanese 2000 Yen Bill. Only the royalty people could use the center gate. It is one of UNESCO World Heritage Site in Okinawa. It is the worshipping gate when the King leaves out of his castle. It was built in 1519 by 3rd King of Sho clan. The infront of the open space that was used for many receptions and ceremonies are surrounded by the main hall, the gate and other building that is very similar to Forbidden City in China. The South hall was used for the messengers of Satsuma, therefore, it takes Japanese style.